Angela Merkel's Party Elects A Successor As She Begins Her Exit From German Politics On Friday, the Christian Democratic Union chose its general secretary, Annegret Kramp-Karrenbauer, a strong Merkel supporter. Merkel, 64, will pass the baton to Annegret Kramp-Karrenbauer, the 56-year-old general secretary of the CDU and strong supporter of the chancellor. 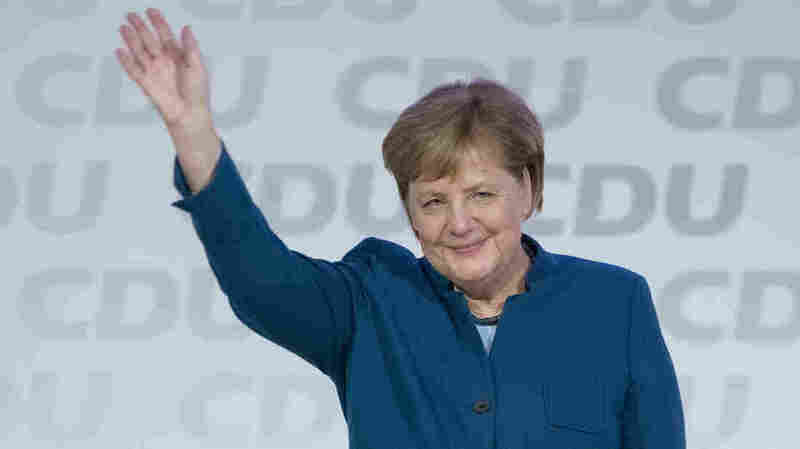 "AKK," as some Germans affectionately call her to avoid stumbling over her name, was Merkel's preferred candidate, at least according to many German media and analysts because the chancellor never publicly endorsed anyone. Kramp-Karrenbauer narrowly defeated fellow party member, Friedrich Merz — Merkel's staunch rival and the former leader of the party's parliamentary group. Nevertheless, Merkel kept her message simple and straightforward as she has over 18 years as leader of the Christian Democrats. She even took a moment to poke fun at herself for being no-nonsense and "bone dry." "Now it's time to open a new chapter," and bring in new leadership, Merkel said. "At this moment, I feel an overwhelming sense of gratitude. It was a great pleasure for me, it was an honor for me." The delegates rose and delivered a lengthy ovation to their long-time leader, with some holding up signs that simply said: "Thanks, boss." Merkel went back out on stage to acknowledge the crowd several times with nods, smiles and waves. She eventually returned to the microphone and reminded the delegates they still had "a lot of work to do." And that they did, as the three-way race for Merkel's successor was a heated one. In the initial round of voting Friday, Kramp-Karrenbauer came in first receiving 450 delegate ballots, but she didn't get a majority. So a run-off was held between her and second highest vote-getter Merz. The 63-year-old Merz advocates a more conservative, harsher approach to the party than Merkel, and in recent weeks, had advocated for a more combative approach to silencing those in the CDU center. Kramp-Karrenbauer, who was formerly the premier of the small German state of Saarland and fairly new on the national political stage, is pretty much assured to be the CDU's successor candidate for chancellor in that national German election. But the mother of three also inherits the difficult task of ending the CDU's lackluster showing over the past three years in local, regional and national elections, as well as winning back hundreds of thousands of voters. Most of them defected to the far-right Alternative for Germany over Merkel's controversial decision to openly welcome asylum seekers back in 2015 when hundreds of thousands of Syrians, Iraqis, Afghans and others came to Germany and other European Union countries to escape war and poverty. "There's a place for both in this party," Kramp-Karrenbauer said, adding the renewed confidence their party elections raised in Germans "must continue and must be connected with the goal that unites us all, to preserve and shape our great people's party."